Kristara Calligraphy is the first and only dedicated calligraphy studio and classroom in Houston. Since 2014, Kristara has taught hundreds of workshops and more than 1,500 students the art of hand lettering. In addition to her in-person workshops, you can learn from Kristara through her online class and modern calligraphy book, Creative Calligraphy: A Beginner’s Guide to Modern, Pointed-Pen Calligraphy available at all major book retailers! 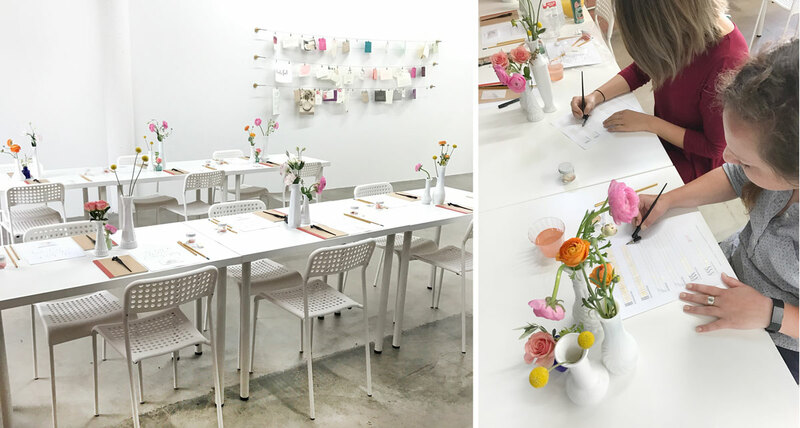 Each class comes with a curated, professional-quality starter kit with supplies for you to use and take home, champagne, and light bites (yes, we consider cupcakes snacks). Feel free to bring your own beer and wine, too! We keep class sizes limited to allow for plenty of one-on-one instruction and Q&A. Register soon to secure your spot. If you’d like to be the first to know about upcoming classes and events, please join our email list! Kristara is smart and super talented. I recently had the opportunity to attend her class as a surprise gift for a good friend. We had a blast and learned so much. Many have asked me about her class and I always tell them the experience is priceless. It is informative, inspiring, and oh so good for the soul. Highly recommend Kristara for all your calligraphy needs! Can’t make it to a monthly class? Do you need a little extra help? Or are you looking for a fun, unique girls’ night or teambuilding event? My private calligraphy lessons come with everything my group classes have and more. You’ll get 2 hours of one-on-one time, a curated starter kit and some fun extra surprises. Private classes start at $125 per person—depending on your group size. Please email me for more information on private lessons, private parties or group classes. Spend an afternoon learning the basics of colorful floral watercolors. You’ll learn all about the equipment (brush types, papers, inks, watercolors, etc. ), technique (flow, pressure, blending) and how to illustrate florals and foliage step by step. And yes, this class is great for beginners! At the end of the class, you’ll use all of your newfound painting skills to create a beautiful art print to take home. Investment: Watercolor lessons are $75 per person (plus ticketing fees) and include supplies to use, bubbly and light snacks (yes, we consider cupcakes snacks). Feel free to bring your own beer and wine, too! NOTE: Tickets are non-refundable, so please make sure you can go before you buy your ticket. Modern calligraphy gift certificates do not apply to this workshop. By popular demand, I’ve decided to host a calligraphy class in North Dallas, so Plano, Allen, and McKinney-area can take my workshop! If you’ve already taken a calligraphy class, but want to take your skills to the next level, this class is a great way to do that. Everything looks better in gold—and calligraphy is no exception! This class will serve as a great refresher while building on your existing skillset. You’ll learn how to work with different gold inks, how to write on dark paper, and even how to write on unconventional surfaces. In addition, you’ll go home with a new alphabet set to practice and two new nibs (different from my regular intro class) to add to your growing collection. Investment: While this workshop is worth its weight in gold (see what we did there? ), tickets are $150 per person and include a curated take-home starter kit, champagne and light snacks (yes, we consider cupcakes snacks). Feel free to bring your own food and drinks, too! Tickets are nonrefundable and cannot be transferred to future class dates once purchased, so please make sure you can attend before you buy your ticket. Modern calligraphy gift certificates can be applied toward this workshop.